Thorogood makes a fire boot that is not only easy to get on and off, but also offers maximum safety features that meet NFPA requirements and are UL certified. These boots are even compliant with blood-borne pathogen protocol. Looking for a heavy duty work boot that combines both protection and comfort to give you something you can wear on the job daily? Look no further; our Thorogood 6 inch American Heritage Work Boots meet those requirements. Thorogood has the footwear for you in its 8 inch Moc Steel Toe work shoe. Proudly made in the USA by ISO 9001 Certified Shoe Company, this shoe features very good slip and abrasion resistance ratings and excellent marks for oil and chip resistance. 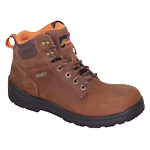 If you are looking for a set of on the job boots that are durable but also classy and sleek, these steel toe work boots by Thorogood are the perfect fit for you. These 8 inch boots provide that extra support that you need for your ankles.